IR Wireless Headphones (Twin Pack) + FREE SHIPPING! Wireless listening for two people! 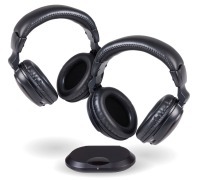 Provides two pairs of infra-red wireless headphones connected to a single wireless transmitter, allowing up to two people to enjoy TV, Radio, PC and other audio sources without disturbing others or getting tangled in cables. The convenience of a good pair of wireless headphones can't be understated. For anybody with thin walls, sensitive room mates or picky parents, having the option of ditching the loudspeakers for personal listening is very important. This twin-pack caters to a wider audience by offering two pairs of headphones joined to the same base station, allowing two people to hear the same audio at once, without cables getting in the way. The transmitter can sit just about anywhere in the room and gets its audio through a standard 3.5mm stereo socket making it suitable for use with televisions, stereo systems, personal MP3 players, laptops and computers and many other devices besides. A 2RCA adapter is included. Pairing is foolproof, just switch on the headphones and you're good to go. The base station can remain active 24/7 thanks to its included Australian 240v power pack, but has an on-off switch for convenience. Each pair of headphones runs off 2 x AAA batteries (not included) and this runs both the headphones themselves and their internal IR receiver. Each pair of headphones has a volume control, on/off switch and an optional 3.5mm input for wired listening. Comfort is reasonable, with padded ear cups and an adjustable headband, so wearing these though a feature length film shouldn't be a bother for most people. Audiophiles may find the sound reproduction is a bit muddy, but for the price we were pleased with the performance especially for vocals. We recommend turning the headphone volume down low and turning up your source to get the best result.